The Randall’s Island Connector will be opened! the uncompleted NOW FINALLY COMPLETED!!! South Bronx Greenway Randall’s Island Connector and the proposed Fresh Direct site. And canoe access sites. Learn about alternatives to current government policies along with post-ride action steps, including demonstrations and letter writing campaigns. Thanks to the 2 decades plus advocacy of South Bronx residents, organizations and the leadership and vision of then Borough President Fernando Ferrer’s 1993 Greenway plan (into which BCEQ, Trans Alt and NOSC had significant input) and has been consistently advocated for by Bronx Transportation Alternatives, Time’s Up!, Dave Lutz from the Neighborhood Open Space Coalition and the long defunct Cherry Tree Association and The Point and Sustainable South Bronx helping manage funding and spearheading engagement with government agencies like Parks and NYCEDC, with early leadership and funding from Rep. Jose E. Serrano and continued pressure by South Bronx Unite and BCEQ and more we could list forever, we will have a safe at grade accessible Greenway from Port Morris, South Bronx to Randall’s Island and beyond! Or meet at the Connector at 11 am. Time’s Up Tour 2003 at the bridge site, advocating for decades for equity and access. 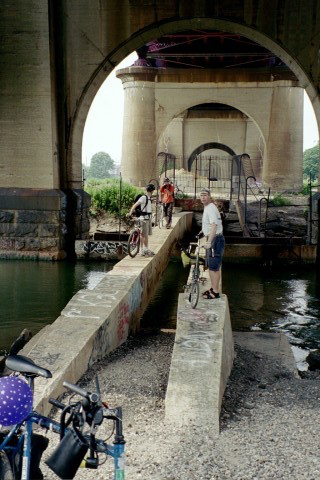 Successful campaign got Con Ed to remove the asbestos concrete encased cables that blocked navigation of the Bronx Kill. Volunteer Day in the Garden!